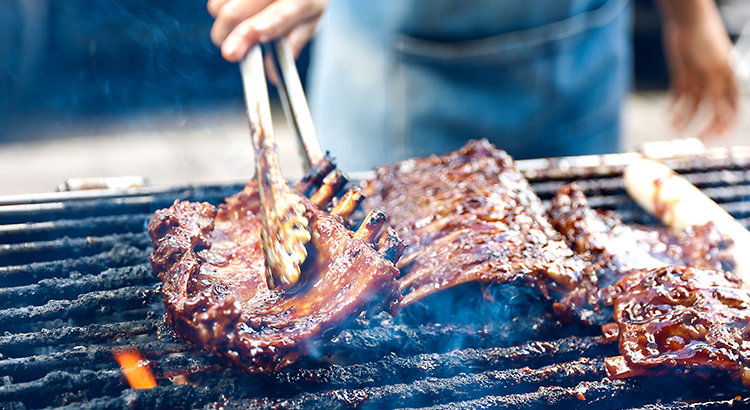 Impress guests the next time you throw a bbq by cooking smoking pork ribs on your gas bbq. Kissed by smoke, hugged by sauce and licked by fire, smoking pork ribs are every meat-lovers favourite when it comes to barbecuing. Pork ribs need long, slow, indirect grilling to create a rich barbeque flavour. You’ll find that some of today’s gas bbq’s come equipped with a metal smoker box that sits on top of a dedicated burner. If your bbq doesn’t have a smoker box you could purchase a heavy-gauge stainless steel smoker box to sit right on top of your cooking grate. The metal will conduct the heat of your grill to the soaked wood chips you place inside the box. There are a number of different types of wood chips on the market for smoking meats, each one has its own flavour and characteristics. PURCHASE: Pork Ribs are widely available at your local supermarket, meat market, or wholesale grocer. You can choose from Baby Back Ribs, Spareribs and St. Louis Style Ribs. PREPARATION: Start by rinsing the ribs under running cold water; making sure to get rid of any loose meat, fat, or bone particles. After rinsing, blot the slab dry with paper towels. MARINATE: Place the ribs in a large, non-reactive roasting pan or a large bowl and cover in your chosen marinade. Once completed, cover the bowl with plastic wrap and place it in the refrigerator for 1 to 2 hours. DRY RUB: Applying a dry rub is essential, the combination of salt, sugar, herbs, and spices will fully enhance the meat’s flavour, add some heat, and help create a tasty surface crust. OIL: Remove marinated ribs from the fridge and blot dry with paper towels. Then add a thin layer of vegetable oil to the ribs on both sides. Finally, wrap the ribs in foil or plastic wrap and refrigerate for at least 1 hour. GRILL: Place your smoker box or foil smoking pouch directly on top of one of the burners you will be using on your gas bbq and turn the burner to the maximum heat. Once smoke starts to emit from the grill, turn the burner to medium-low and place the slab of ribs on the grate over the burner not in use. Maintain a temperature of 225 to 235 degrees throughout the cooking duration. ENJOY: Partner the ribs with your favourite sauce and then sit back and enjoy your work. You can stick a toothpick between two bones – If it goes in and out of the meat without resistance then they are done. Cut the bone on the end off and taste it to see if it’s cooked. Cut into the meat with a knife and check to make sure there is no pink juice near the middle of the meat. Thanks for taking the time to write out the steps to make smoking pork ribs! Listening to someone else explain it makes it seem a lot more difficult, but having the steps laid out like this makes it sound like something I could handle! How long should I grill the ribs for? Grilling time for your ribs varies and depends on the size and thickness of your meat. However, you can try grilling your ribs for 30 minutes on each side under indirect heat. After that move your partially cooked meat onto direct heat then cook it for 20 to 40 minutes more until pork is tender. At this time, try doing any of our suggested steps to check meat doneness then adjust your cooking time accordingly. Happy grilling!